Myfrontdesk allows you to enable a number of possible permissions for the customized roles you create for your employees and staff. This guide will show you how to add permissions for roles and also explain what the permissions mean. Click on the settings menu (gear icon) (1) and then select 'Roles' (2). You can either click "Add" (3) to create a new role or the edit icon (4) to change a previously created role. Role name is mandatory field (1) and description is optional (2). Hotel Profile: Users will be able to change the property type, language, time zone, property images, as well as business information. Amenities: Users will be able to select which amenities the property offers as well as the individual room accommodation amenities offered. Payment Options: User will be able to select which payments are accepted by the property. Accommodations: User will be able to set up the accommodations and allotment of property. Hotel Policies: User will be able to set the terms and conditions, deposit policy and cancellation policy. Booking Engine: User can install the facebook application, website widget, as well as customize the header and footer on the booking page. Custom Email Templates: User can customize the emails that are being sent to the guests. Distribution: User will be able to set up the OTA channels on which to sell inventory, as well as manage how inventory is distributed on other OTA channels. Registration Cards: User will be able to create the registration cards that will be printed for the property. 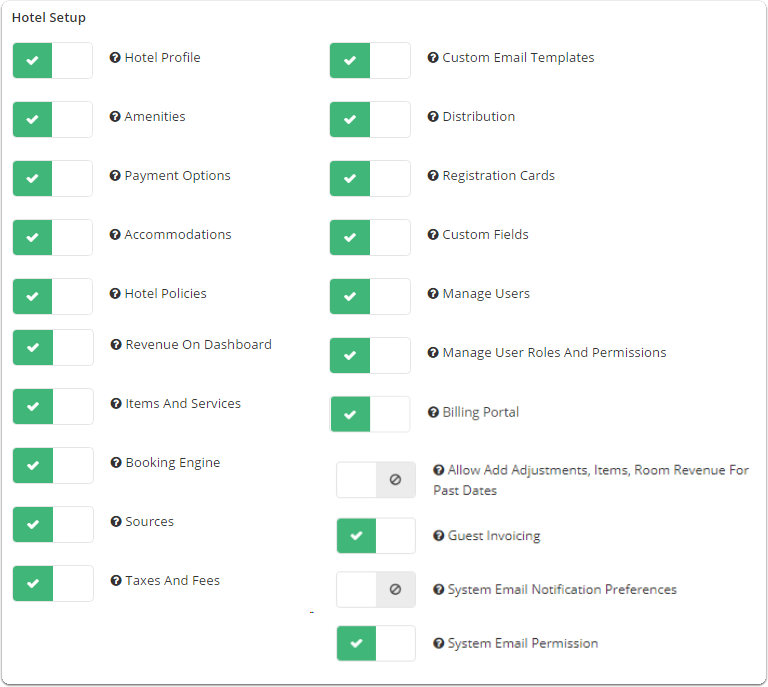 Custom Fields: User will be able to add custom fields to direct reservations, the booking engine, and the registration cards. 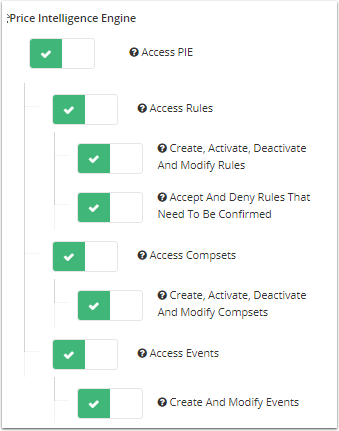 Manage User Roles Permissions: User will be able to add new user roles as well as modify existing ones. 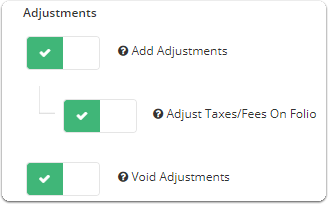 Allow Add Adjustments, Items, Room Revenue for Past Dates :You can allow/disallow users, add adjustments, items, room revenue for past dates. Guest Invoicing: User will be allowed to access the invoice setup page in order to make changes to how the invoice is created. System Email Permission: User will be able to view both the email delivery log (This tab can be found in Manage -> EMAIL CONFIGURATION -> Email delivery log) and the email history directly in each reservation. Bar Rates: User can add and edit daily rates. 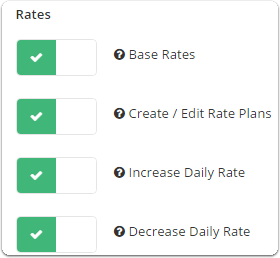 Create / Edit Rate Plans: User will be able to create rate plans, as well as edit the rates and restrictions for all accommodations. Increase Daily Rate: User will be able to increase the rate on any single day. Decrease Daily Rate: User will be able to decrease the rate on any single day. Receive Payment Processing Emails: User will receive an email each time a payment is authorized, processes successfully, refunded successfully, or an error occurs attempting any of these actions. 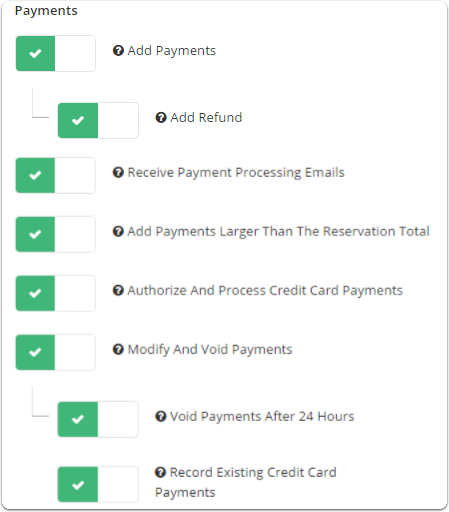 Add Payments Larger Than The Reservation Total: User will be able to add payment that is higher than the remaining reservation amount. Authorize And Process Credit Card Payments: If enabled, the user will be able to authorize a credit card using payment processing, charge an existing authorized card, or process a payment for a specified amount. Record Existing Credit Card Payments: If enabled, the user will be able to post credit card payments to folio for payments that were processed elsewhere (e.g. your local POS) not via integrated Payment Gateway. The permission will be visible only when payment gateway feature is enabled for the property. By default this permission will be turned on. If permission is disabled it will not show the option "Record Previous Payment (Don't charge card)" in Add payment section in the Folio. Adjustments: User will be able to add adjustments to all reservations and accounts. Allow To Override The Price Of Product On Reservation / Account: User will be allowed to modify the price of the product when adding it to a reservation or an account. Modify Reservations: User will be able to modify reservation dates, room types, details as well as change the reservation status. Modify Reservation Rate: User will be able to modify the daily rate and/or the total rate on a reservation. 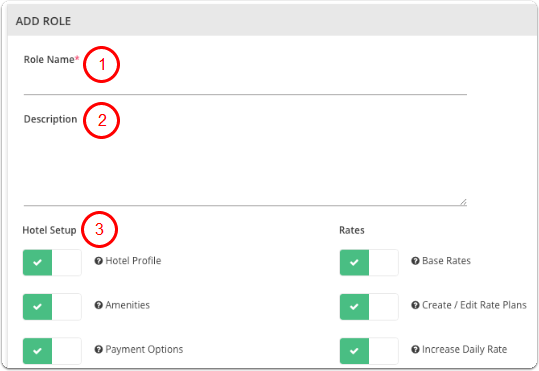 Override Rate Difference: When a guest is moved from one accommodation type to another using the calendar, and the rates between the two accommodations are different, the user will be able to override the rate difference. Create Third Party Reservations: - User will be able to create Third Party reservation on dashboard. 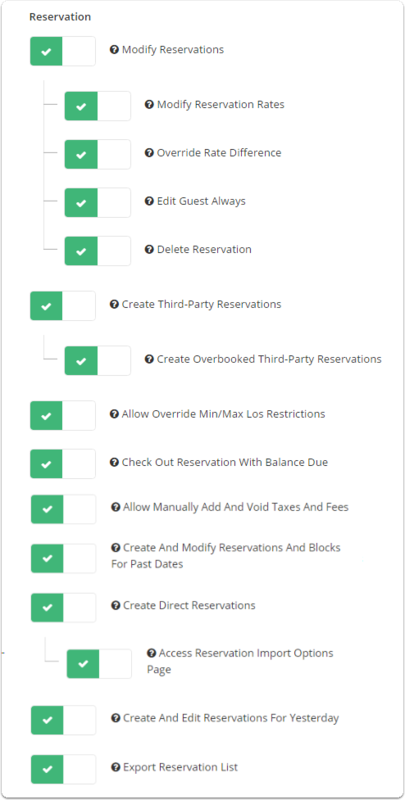 Create Overbooked Third-Party Reservations: Users will be able to create third party reservations for dates with no availability. Check Out Reservations with Balance Due: Allows user to check out a guest from the platform with an outstanding balance due on account. 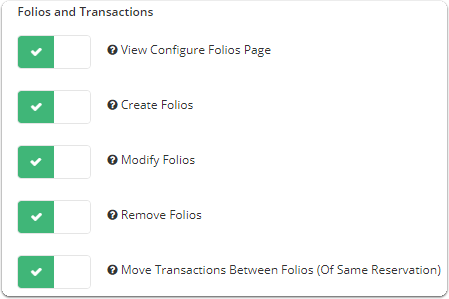 Allow Manually Add and Void Taxes and Fees: Users are able to add/void taxes and fees to guest folios. -Create reservation for any available date in the past. -Modify check in and check out dates for a reservation with past dates. -Edit rates for the reservation in the past. 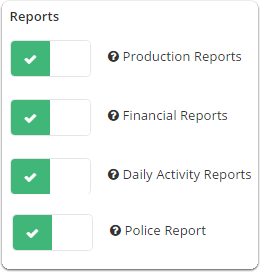 -Delete transactions posted in the past (remove from reports). Access Reservation Import Options Page: User will be able to import reservations through a simple import form. Disabling this permission does not affect adding reservations manually through "Add Reservation" button, or through the calendar. Create and edit Reservations for yesterday: The user can create or modify reservations for only 1 day in the past to account for late night and early morning walk-ins. Export Reservation List: User can export a list of reservations with various fields of data. Please note some of this data may be sensitive and so permissions should be granted with discretion. Create / Modify / Delete Drawers: User will be able to add and remove cash drawers that exist within the property. View Reports of All Users: User will be able to view all the cashier reports, not just their own. Add Cash Transactions Without Having Drawer Open: User will be able to add payments and adjustments without opening a cash drawer first. Close Drawers Opened By Others: User will be able to close a drawer that was opened by another user. 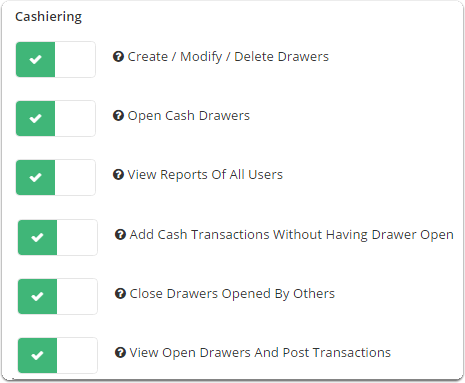 View Open Drawers And Post Transactions: User will be allowed to view all open drawers and post cash transaction to ANY open drawer. Create Out of Service / Room Block From Calendar: User will be able to create a room block or an out of service block from calendar. Availability Block: User will be able to block out one or more room types on all channels (distribution and availability tab). Add / Use House Accounts: User will be able to create new house accounts, add payments and adjustments to existing ones. Add Private House Accounts: Create private house accounts. 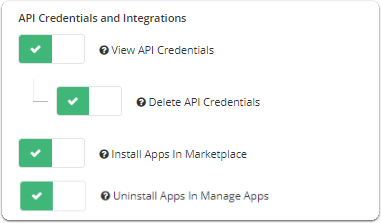 View API Credentials: Allows user access to "API Credentials Page"
View Sensitive And Personally Identifiable Information: Sensitive and personally identifiable information is securely obscured within Cloudbeds. If the user has permission to view this data, they can click to view this data. If not, the data will remain obscured. View Tax ID: User can view Tax ID in a reservation, guest profile, and some government integrations. 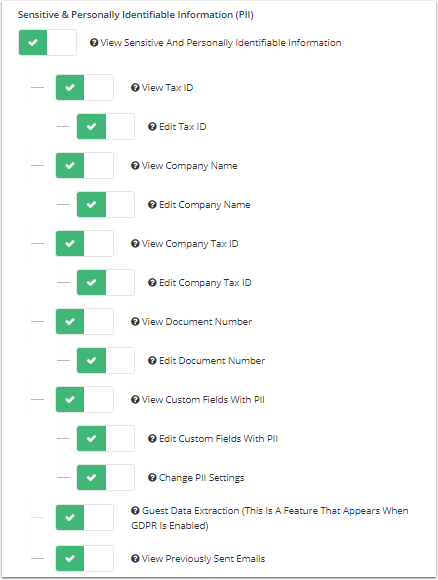 Edit Tax ID: User can edit Tax ID in a reservation, guest profile, and some government integrations. View Company Name: User can view the guest’s Company Name in a reservation or guest profile. Edit Company Name: User can edit the guest’s Company Name in a reservation or guest profile. View Company Tax ID: User sees guest’s Company Tax ID in a reservation or guest profile. Edit Company Tax ID: User can edit guest’s Company Tax ID in a reservation or guest profile. View Document Number: User can view the Document Number in a reservation or guest profile. Edit Document Number: User can edit the Document Number in a reservation or guest profile. Change PII Settings: Grants security clearance to user to change custom field settings and indicate if field does or does not ask for sensitive data. Guest Data Extraction (*This Is A Feature That Appears When GDPR Is Enabled): User is able to perform guest data export, which may include sensitive data.